Pet Wants Hamilton: Why Do Cats Arch Their Backs? Why Do Cats Arch Their Backs? Halloween is coming up very soon, and we hope you’ve been having plenty of spooky fun all October long. There are a lot of different symbols associated with this holiday, including black cats. While black cats can be depicted in a variety of ways on Halloween decorations and other items, having an arched back is one of the most common poses. When cats are depicted with their backs arched, they may also be shown to have a snarl on their face. Although this pose can be quite intimidating, it’s actually the result of a cat being scared. If a cat senses any type of threat and wants to protect themselves, they may assume this pose to show that threat just how tough they are. An arched back that’s triggered by this emotion may also be accompanied by spitting, growling or hissing. If your cat acts this way, you’ll want to see if you can figure out what’s triggering it. And if you ever encounter a cat outside that’s displaying this combination of behaviors, it’s best to keep your distance. Just because a cat arches its back doesn’t mean it feels scared and is trying to intimidate whatever is around it. This behavior may occur when a cat is feeling playful. 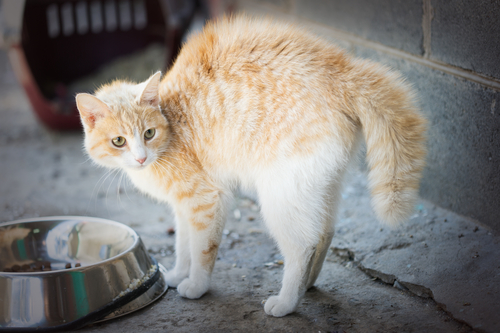 As you may have guessed from our detailed description above, the best way to figure out whether arching is the result of a negative or positive emotion is by seeing what other signs your cat is showing. If your cat’s back is arched and it’s pouncing or hopping instead of doing things like showing teeth, chances are very good that your pet is in the mood to play. In addition to intimidation and playfulness, it’s possible for a cat to arch its back without having any specific message to communicate. This pose can be as simple as a cat stretching. Similar to how humans stretch throughout the day, a cat may just be loosening up or working out some kinks. The main difference is because cats are so flexible, stretching via an arch is usually much more noticeable in them than it would be a human.